I can identify what personalization is (4.1). I can develop a personalization plan for my class (4.1). I can develop a guide for personalizing students’ learning goals (4.2). I can develop strategies for personalizing assessments (4.3). I can develop strategies for personalizing learning activities (4.4). All learning is personal. How you learn something, when you learn something, and what you decide to do with what you learn are all ultimately up to you. This is because you have different interests, wants, and goals than we do, and you probably have different interests, wants, and goals than the teacher next door. Like leading a horse to water, a teacher can lead students to a textbook (or software program, or learning activity, etc. ), but no one can force them to read it, much less learn from it. Personalization [https://edtechbooks.org/-PET] consists of a system of mindsets and practices that allows teachers to increase a student’s chances of engaging with learning materials, mastering learning materials, and applying learning materials to the real world based upon the student’s own interests, wants, and goals. But what does personalized teaching look like in today’s K-12 schools? Schools have always been about students. They may be run by adults, and guided by policies written by adults, but schools are not for adults. Walk into any K-12 school, and it is apparent that it is a place for students. The students often outnumber the teachers, administrators, and support staff, by up to a 30:1 ratio. Twenty-first century teachers face the challenge of making learning personal for 20 to 40 students at a time. Blended teaching allows us to shift from teacher-led practices — in which the teacher determines what should be learned, when it should be learned, and how it should be learned — to more student-centered practices that give students power over their own learning journeys. This is not to say that teachers should let students run freely throughout the hallways. Teachers are still leading a school, not monitoring a playground! (Though they sometimes do that as well.) Personalization gives students more power, not ultimate power. Teachers are usually best suited to make decisions that guide learning. Personalization simply allows teachers to emphasize what we have always known — learning is personal. Technology has made it easier than ever to make learning personal. Through the integration of online learning programs or learning management systems (see Chapter 2) and the use of data (see Chapter 3) you can help students learn in ways that matter most to their specific interests, wants, and goals. Blended learning allows you to give students some freedom to choose when, where, how, and how quickly they learn. You can use the link above to obtain some feedback concerning your preparation for personalizing in a blended environment. How ready are you? We introduce the concept of personalization (see Video 4.1) in this chapter because blended classrooms increase the ease of personalizing various instructional activities (developing learning goals, assessing outcomes, and completing learning activities) through the integration of online activities (see Chapter 2). Personalization, however, is not new to blended learning, nor is it new to the 21st century. What to Look For: Notice how personalization changes the experiences of students. Additionally, personalizing a particular aspect of education does not necessarily mean it is better than a non-personalized aspect of education. In order to craft a learning plan for your classroom, you need to know what constitutes personalization and how to make those practices effective. The term personalization [https://edtechbooks.org/-PET] is being used with increased frequency by teachers in K-12 settings. 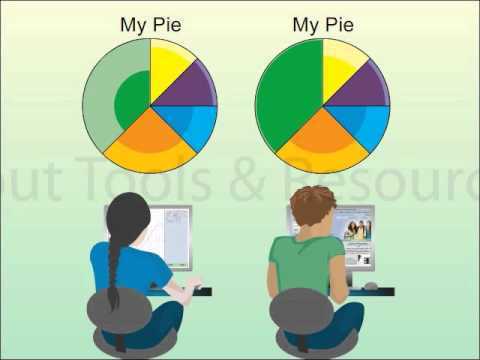 It can easily be confused and conflated with terms like differentiating [https://edtechbooks.org/-jo] or individualizing [https://edtechbooks.org/-ueq] learning, which have been around for a long time and have similar meanings. In fact, the term personalization and the ideas that it encompasses continue to evolve. Table 4.1 shows some of the current definitions of “personalization” courtesy of the Office of Educational Technology, part of the U.S. Department of Education. Customization: Tailoring/customizing the learning experience to the individual student’s needs and interests. Student Control: Giving students some element of control over their own learning experience. Personalization gives the students some control over customizing the goals, time, place, pace, and/or path of their learning experience (see Figure 4.1). Differentiation is also a good practice but is distinct from personalization because it typically involves the teacher controlling the significant decisions about goals, time, place, pace, and path of the learning experience, rather than giving that responsibility to the student (see Table 4.2 for examples). Figure 4.1 Five dimensions where personalization can occur. An effective blended classroom will mix these two practices—differentiation and personalization. (See Web Resource 4.1.) When you incorporate personalization into your classroom, you will not leave students to make all decisions on their own. Rather, you will guide them in making their personalization decisions. Table 4.1. Various personalization term definitions. Table 4.2. The differences between differentiation and personalization. Teacher establishes some goals for the class that all students will work towards (for example working towards achieving state standards). While some outcomes may not be negotiable, students are allowed to develop some personal goals related to their interests that they can choose to spend time on. Teacher chooses when the whole class will participate in an instructional activity. Teacher determines when an individual or group of struggling students will conference with her. Students can make choices about how to spend their time working towards different goals. For example, one student may choose to spend flex time working on a science project while another chooses to work on reaching the next math level. Teacher selects project groups and assigns groups based on perceived needs of students. Teacher determines where remediation will take place and whether it will be using adaptive software, 1-1 tutoring session, small group instruction, etc. Classroom has flexible workspaces, and students can choose where and with whom to work towards goals. Students may choose to work on some goals within the classroom and others in a virtual space while at home. Teacher determines when the class begins and ends working on a lesson or unit. The teacher may give extra time for students who are struggling. Teachers may establish minimum pacing guides and students can choose to accelerate their pace of learning according to interest and goals. Playlists are provided that allow students to proceed through activities at their own rate. Teacher determines the sequence of activities that everyone in the class will complete. Teacher determines what additional activities certain students need in order to achieve mastery and assigns those activities to the students. Students work towards mastery by choosing activities that match their learning preferences (e.g., working independently or on a team). Students choose from among a list of activities that will help move them towards mastery. Students choose some activities based on their talents and interests. What to Look For: Check out this resource to see how some people view the differences between personalization, differentiation, and individualization. Do you agree with their distinctions? On the next few pages are four “See it in Action” examples (two elementary and two secondary) where teachers are trying to implement a personalized learning approach with their students. For each example there are several videos that highlight different dimensions where personalization is occurring. [http://bit.ly/btb-v258]TIME- Teacher chooses learner pathway with rotations that include “teacher time” for students below 50% performance—student has control over when to go to “teacher time” rotation. [http://bit.ly/btb-v320]GOAL/PATH- During “genius hour” students choose a “passion project” that they want to focus on. [http://bit.ly/btb-v440]PATH- Students have an “opportunity hour” where they choose from among 8 topics of interest outside the traditional curriculum. [http://bit.ly/btb-v496]PLACE/PATH- Students have choices in how they demonstrate mastery of a concept. Choices include tests, projects, teaching a lesson, etc. Flexible seating arrangements also allow students to choose where they will do their work. [http://bit.ly/btb-v421]PATH- Students are able to request in-person help through 1:1 teacher consultations, teacher-led seminars, or student mentors. [http://bit.ly/btb-v483]PACE-Students progress at their own pace and move beyond grade level based on assessment data. [http://bit.ly/btb-v403]PATH/PLACE- Students are given a “menu board” of activities that can help them move towards mastery. Students also choose where and with whom they work. [http://bit.ly/btb-v486]PATH- During independent work time, students choose what outcomes and software to work on. [http://bit.ly/btb-v489]GOALS - Students look at data with teacher, set SMART goals, and determine how to progress towards goals. 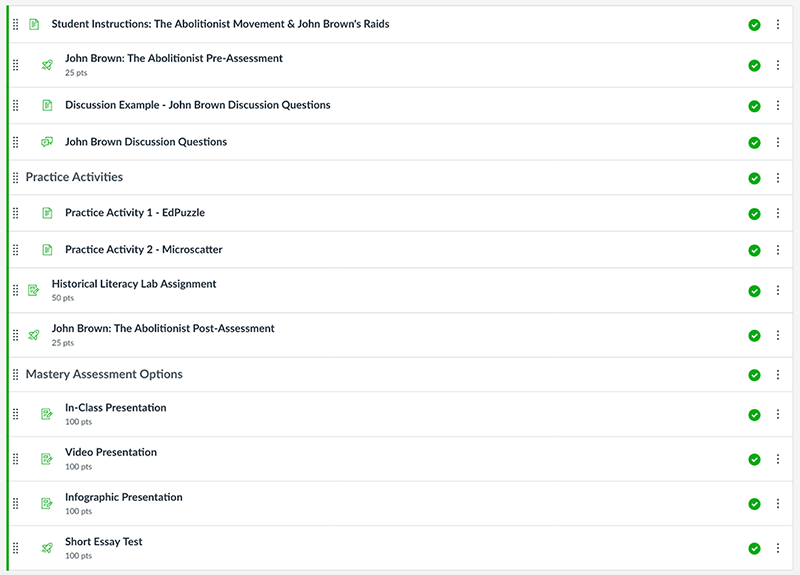 [http://bit.ly/btb-v388]PATH - Students have assignments (required) and extension activities (optional) on playlists. [http://bit.ly/btb-v416]PLACE - Students are able to make choices about where and with whom they work with to reach their goals. [http://bit.ly/btb-v491]GOALS/PATH/PACE-Students take a diagnostic assessment and then choose learning resources to pursue to meet areas of deficiency. Students can adjust pace by skipping assessments based on diagnostic results. 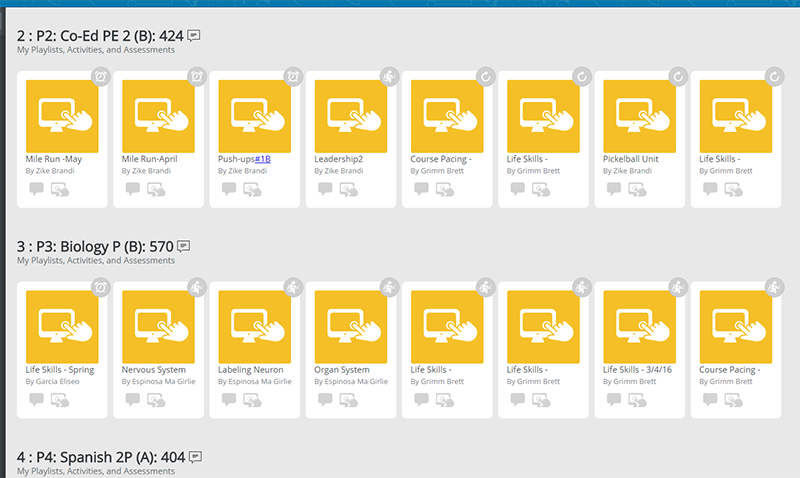 [http://bit.ly/btb-v417]PATH/PACE- Software recommends learning resources that students can choose to pursue to correct misunderstandings. [http://bit.ly/btb-v318]GOALS- Students set goals around completion, performance, or habits/mindsets about learning. 4.1.2 What is the Role of Technology? GOALS— technology can provide an efficient way to create, share, and track student goals as well as to tie them back to performance on learning outcomes. TIME— technology allows students to work independently (with feedback) while teachers are working 1-1 and in small group teaching sessions; technology can support students working on different tasks at different times where a teacher can only be one place at a time. PLACE— technology can be used to give access to learning resources both in and outside of the classroom. PACE— technology can provide efficient tracking of individual student mastery, which makes it practical to allow students to work at different paces. PATH— technology can recommend or help teachers to recommend targeted learning resources or pathways for students to follow; software can provide data that helps students and teachers to make more informed decisions about future learning activities. There are many frameworks that suggest how to implement personalized learning in the K-12 classroom. Our goal for this section of the chapter is to present an overview of some of these frameworks, providing you with three steps to follow in creating an implementation plan for personalization that works for you. While there are nuances within these frameworks that differ, most of them have much in common. All personalized learning frameworks are founded in increasing opportunities for students to practice their agency as part of their educational journey. The implementation of personalization is all about helping students control the time, place, pace, and/or path of their own learning experiences. Before we get to the students though, it is important that we discuss your role in personalization and what you need to do to be prepared to implement personalized learning. Step #1: Don’t go at it alone. In July of 2018, Forbes2jumped on the latest education bandwagon by publishing the seven ingredients needed to create a personalized learning program. 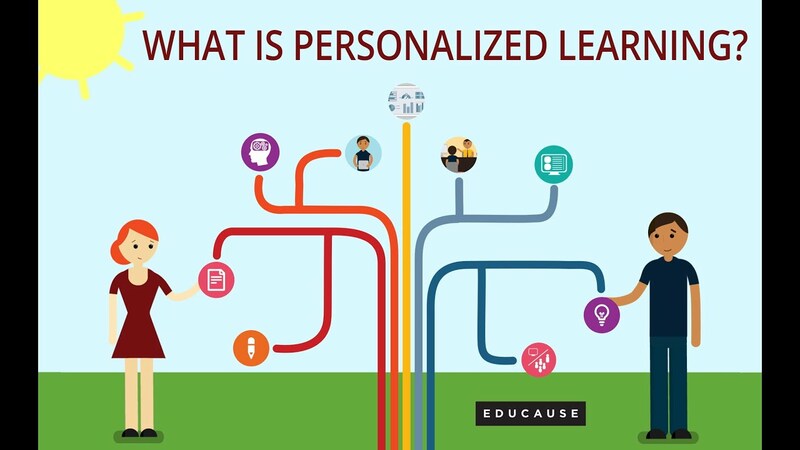 Because their list focuses on developing a personalized learning program that can be sold to educators, like Khan Academy or Imagine Learning, many of their seven ingredients for a successful personalization system may not apply to teachers seeking to implement a personalization pedagogy. Their first ingredient, however, is one worth noting—personalization requires a huge library of materials. While there are certainly dimensions of personalization that can be implemented without a huge library of materials, having such a library can make it easier to personalize elements such as pace or path. This is why it is beneficial to establish a professional learning community to help you begin implementing personalization practices. You are off to a good start by using this book to help you, but this book alone is not be enough. Its authors can’t be in the classroom to help you manage blended activities. They can’t help you gather the resources needed to teach important concepts in your content area. And they can’t help you arrange your LMS to meet the needs of your students. They can only point you in the right direction. But if you work together with your peers, you will be able to alter your classroom activities to foster personalization, get help finding or creating instructional resources, and then housing such resources in a place that makes them accessible to students. Personalization in education is all about working together. So, work with both your peers and your students to find learning activities that appeal to a wide audience of students. [http://bit.ly/btb-v341]Getting started with Google Forms to create your own learner profile survey. [http://bit.ly/btb-v393]LAN Learner Profile Grid offers a variety of learner profile resources based on age groups. [http://bit.ly/btb-v307]The Vermont Department of Education offers a blank template to use as a learner profile as well as a completed example. [http://bit.ly/btb-v324]The Charlotte-Mecklenburg Schools also offer a variety of learner profile resources for younger ages. Step #2: Get to know your students. If your end goal is to create a learning atmosphere that is student-centered, you first need to know how to connect with your students as individuals. While nothing should replace having getting-to-know-you conversations with students, perhaps the easiest and most efficient way to learn about large numbers of students is by asking them to complete a learner profile. What you learn can also help to better inform your personal conversations with students. While learner profiles can be paper-and-pencil based surveys, we find that it is better to use electronic surveys because they can more easily be accessed, updated, and tracked. Parents are impressed when you can show them the growth of students’ performance scores, but imagine how impressed they will be when you can also show them the changes in their students’ interests over time. Do you prefer to learn in a quiet environment, one with some noise, or one with lots of noise? Do you prefer to listen to music when you learn? Do you most prefer to work with others, by yourself, or equally with others and by yourself? Do you think you learn best in the morning, right before lunch, right after lunch, or at the end of the day? When you get stuck do you most like to ask the teacher for help, try to figure it out on your own, or ask a friend for help? These kinds of multiple-choice questions allow you to know students’ preferences for learning. For more detailed data, you could even allow students to rank their choices. With answers to these questions you can know if Alexander gets distracted by noisy students around him, if Clara prefers to work with others when solving problems, if Francis learns best right before lunch, and if Milton is asking you for help because that’s his go to method of help-seeking or if he’s likely already asked a friend or tried to work it out on his own. Understanding your students’ learning preferences can help direct your actions as a teacher. You can now know whether you need to move Alex in the seating chart, whether you can send Clara to work with a group to get the help she needs, whether Francis struggles with math because it’s at the end of the day, and whether you need to ask Milton to try to work out a problem on his own before you give him additional help. You can also use this information to create student groups so that students who like to work together are all in a group, or students who like to listen to music are in a group. You can also look at this data to identify trends in your classroom. If most students learn best in the morning, then maybe that’s the best time to introduce that difficult weather unit, or for junior high and high school students, maybe you need to understand that a student’s weakest subjects should be scheduled for the morning hours. Are you involved in any extracurricular activities? If so, what are they? Do you have a favorite musical artist, TV show, sport, movie, video game, or book? If so, what is it? Who are your friends in this class? You may not want to use all of these questions, but you could pick a few to ask your students. Remember that the learner profile survey should be accessible to students so they can easily update it often. The student who likes one band this week might discover a new band over the weekend, likewise yesterday’s astronaut might want to be a video game developer today. When you ask elementary students questions like, “What do you want to be when you grow up?” you should expect some creative answers. They don’t have to identify careers. You might get answers like a princess, a mom, a superhero, a cowboy, or an astronaut. You might also have students who give you answers like primatologist or paleontologist. In either case, you can use these interests to guide younger students. Table 4.3 considers how you might teach a small-group math lesson to a group that contains two princesses, two superheroes, and a paleontologist. For this example, we have chosen a Common Core Math standard and then adapted it to meet student interests. In practice, we would meet with a small group of students and use their interests to help determine the context of the problems. In a group of 5 students that has two princesses, two superheroes, and a paleontologist, we would share at least one problem for each kind of interest. In the princess’s royal piggy bank vault there is 5 dollars, 2 quarters, 1 dime, 1 nickel, and 2 pennies. How much money does the princess have in her vault? Can she buy a tiara that costs $5.86? There is a superhero meeting with superheroes and their sidekicks. Each superhero has 1 sidekick. If there are 10 groups of heroes (1 hero and 1 sidekick) at the meeting, count by 2 to determine how many heroes there are total. Understand a fraction 1/bas the quantity formed by 1 part when a whole is partitioned into bequal parts; understand a fraction a/bas the quantity formed by aparts of size 1/b. At a dig site you found a single rib bone of a stegosaurus. If a stegosaurus has 32 rib bones, what fraction of rib bones have you discovered? The examples in this chart represent both personalization and differentiation. They are personalized because the students have had some choice in selecting the topic of the problems, but they are also differentiated because the teacher has chosen the actual problems, modifying them to match student interests. 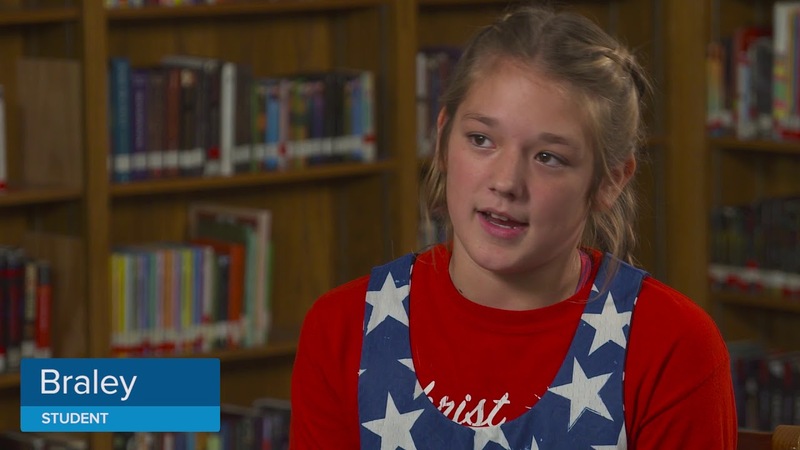 As students reach their middle school years, you can begin to focus learner profile responses toward having a greater level of critical thinking. For example, unless you’re Meghan Markle (the American-born actress who married Prince Harry, Duke of Sussex, in 2018), you probably can’t become a princess. However, you can still have lots of people who work for you and be at the top of the social ladder if you’re a CEO, so let’s explore that career choice. As students reach high school, you want to make sure that your questions are helping you understand their college and career readiness goals. Are students planning to go into the military, straight into the workforce, go to trade school, community college, a public university, or a private university? Each of these students will need an education that prepares them in slightly different ways. You can also ask secondary students to report things like their reading levels, grade point average, and standardized test scores. These performance scores are usually available via your district’s student information system (SIS), but it can still be valuable to have students report them so you and they can (a) know what their scores are, (b) understand what their scores mean, and (c) track their scores over time. Once you understand students’ learning preferences and interests, you can begin to make sure that your instructional materials and activities are more student-focused. Step #3: Give students more control. If you have ever talked at length with teachers, you know that a goal of nearly every educator is to create lifelong learners. This is difficult to do if you train students to believe that learning is what happens when a teacher is available to present a lesson, provide practice, and then assess learning. When you give students more control over choosing, tracking, and assessing their learning, you are providing them with the skills they need to become lifelong learners. Now, this doesn’t mean it’s all right to hand students a textbook then recline at your desk checking social media, following scores of the local sports team, or catching up on the news. As a teacher in a blended environment, your role is to guide students in making the best choices for their learning. Giving students more control can be intimidating because they likely don’t understand the standards they need to meet, AND because it may make classroom management more difficult, AND because there is a lot of uncertainty around students’ self-direction, but we know YOU CAN DO THIS! Advocate for needed support from you, peers, technology, and/or other sources. Many of these practices can be easily implemented through using learner profiles, conducting student conferences, and teaching students to be self-directed learners. Student-led practices begin to provide students with various ways to choose their own time, place, pace, and path for learning. See Web Resources 4.11-4-12 for examples. After adding some Student-led practices to your classroom, you can begin to build student-demonstrated practices into your classroom, which provide students with even more opportunities to control the time, place, pace, and path of their learning. What to Look For: Explore these strategies for learner led practices if you want more information. Which strategies do you think you could use? Receive recognition based on competency, not on seat time. What to Look For: Check out some of these strategies for learner led practices. Which do you think you could use? Most of what we have looked at so far focuses on teacher-led or teacher-centered approaches to learning and injecting those approaches with personalization adrenaline. However, there are also student-centered approaches that may make it easier to personalize learning for students. Check out the Call out Boxes on the following pages to learn more about these approaches. Open: The teacher attempts to get students interested in the general topic. This phase is only focused on big ideas and concepts. For instance, a teacher might start a unit on WWII by leading students in a discussion/debate about what's worth fighting for. Immersive: After students are interested in the topic, they are engaged in an immersive experience that introduces students to the actual topic. For instance, a teacher might invite a WWII veteran to speak with students and/or watch a documentary or movie about WWII. Explore: Students explore a variety of resources to learn more about the subject. Teachers curate a variety of resources for students to explore such as images, books, videos, etc. Identify: Students identify a specific topic and question(s) to guide their research. Teachers can prompt them by asking them questions such as "What are you wondering about?" Teachers can also help students identify an authentic audience for their work by asking students to consider who else also cares about their research question(s). Gather: Students begin to gather resources to answer their research question. The teacher guides them along this process and teaches them how to identify and evaluate materials. Create: Students create materials that answer the question in authentic ways and have the potential to help others. Share: Students package and share/present their materials to others in authentic ways. Evaluate: Students evaluate their projects and the process they followed to create them. Another way that you can create student-centered lessons is by incorporating project- and problem-based learning into your lessons. These two instructional methods are similar; in fact, some groups, such as the Buck Institute for Education, view problem-based learning as a kind of project-based learning. Both approaches allow students to be at the center of instruction and require students to become more active in the learning process. The possibility of longer, more multi-faceted planning than traditional instructional activities or assessments. Step #4: Choose your blended model. 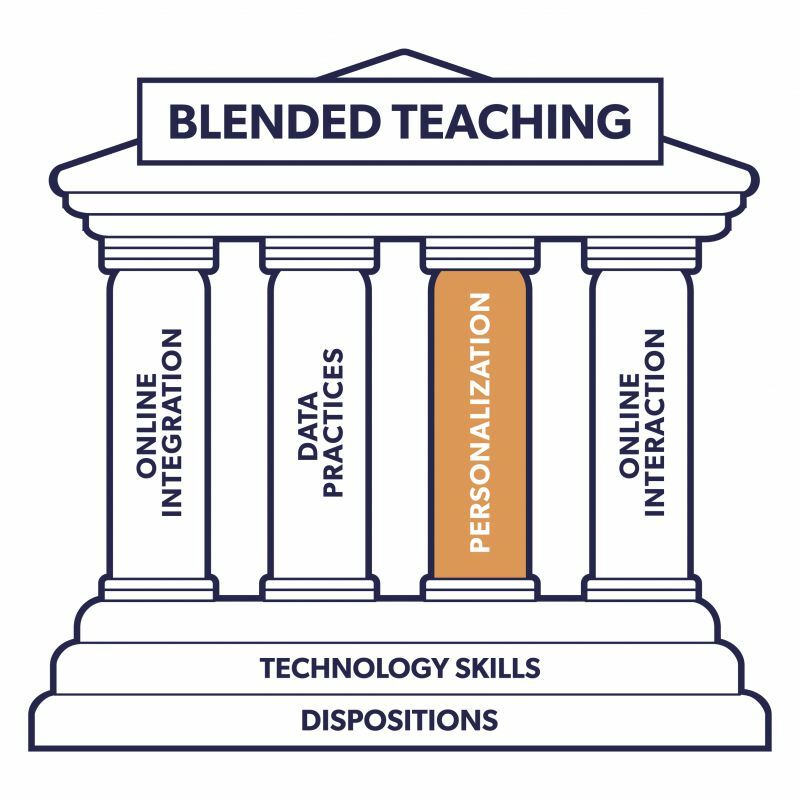 In Chapter 2, we introduced several different models of blended teaching. All of these models are conducive to personalizing your instructional practices. Often the personalization comes during the online portion of blend. Later in this chapter you will be introduced to tools such as choice boards, playlists, and adaptive learning software, which can provide a structure for facilitating personalization in the different models. It is important for you to find the right balance between structure and flexibility in your classroom. An increasing number of research studies have found that students don't perform as well in classes where they are given total flexibility in when, where, and how they learn. Children and adolescents simply do not have the self-regulation and metacognitive skills to thrive in learning environments where they are provided with total flexibility. Furthermore, if all students are working on different tasks at any given time, meaningful collaboration and discussion are almost impossible. As a result, teachers must understand the needs of their students and provide them with the level of structure and flexibility that they need. Competency: I can develop a personalization plan for my class (4.1). In creating lesson plans, you usually need to plan for three different parts of the plan. First, you plan or outline the goals for your lessons—what it is that you want students to be able to illustrate or understand at the end of the lesson, instruction, or unit. Next, you plan the assessments that will tell you how well students are able to meet these goals. Last, you plan activities that will prepare students to successfully complete the assessments you have planned. Figure 4.2 Three basic elements of planning blended lessons. As a teacher, you don’t often get a lot of say in the educational goals for your students because the standards that you must use for teaching are given to you by some education authority. You often, however, do have more freedom in deciding how you meet those standards. You can work together with your students to co-create how learning standards will be met, enabling you to personalize learning objectives. This collaboration with students can be a lot of work, but it is worth it because giving students ownership over their learning outcomes can increase student engagement, retention, and achievement. You know what is best for your students. You should guide students to set goals for themselves that you know will help them reach their fullest potential. This is usually done through having students complete guided surveys or worksheets that help them create learning goals and conferencing with individual students about these goals. The goals that you help students set, track, and review can be related to learning objectives, 21st century skills (the 4Cs), and/or classroom behaviors. Setting goals: In setting and tracking students’ goals, both you and your students must have access to some kind of performance data. If data is not available, then the first goal should always be to generate data (see Chapter 3). Once you have performance data for your students, you can sit down with them to help them establish goals or set new goals. These goals may be to improve upon previous learning standards or to begin working on new learning standards. It is best to save these goals in a folder (whether electronic or physical) that gives students easy access to them. Goals should be visible to students so they can easily remember and track them. When setting goals, we recommend using something like the SMART goal framework (See Figure 4.3). The above examples are specific by detailing how many problems the student is expected to complete, how many slides the student needs to create, or how many pages the student needs to write, and in how much time. They are measurable in that the student can know whether the completed problems are correct or incorrect, or if the projects follow rubric guidelines. They are achievable because they all have a plan that details how goals will be completed (by studying, by researching, or by following examples). They are also realistic because they represent goals appropriate to the skill levels of the students. Lastly, each goal has a timely due date, as opposed to taking all month or semester, etc. Note that SMART goals allow for learning goals to be personalized by changing the time, place, pace, or path in which the goal will be achieved. Tracking goals: After goals are established, you and your students can use goal tracking sheets to track progress and success in meeting the goals. For elementary students these are often simple reports with scaled ranking systems consisting of 1-3 smiley faces, stars, or some other visualization of progress. Older students can fill out more detailed and reflective tracking sheets. They can answer questions like “What do you think impacted your success today?” or “How can you do better tomorrow?” Additionally, older students can track numerical data to show whether they are doing better or worse today than yesterday. What to Look For: How could you use or modify these examples of goal setting and goal tracking sheets to help your students personalize their learning goals? Reviewing Goals: When a goal has reached the end of its established timeline (3 days after the lab in the previous secondary example), or students have attained their desired level of success (20 out of 20 problems correct in the previous elementary example), it is time to have students complete another guided goal tracking document. Then, have another student conference to review both their new goal and their previous goal. In this meeting, you will help students determine if they need to revise their previous goal to make it more or less ambitious or decide together if students are ready to move on to a new goal. Competency: I can develop a guide for personalizing students’ learning goals (4.2). Find or create a goal setting template for your students to use in setting and achieving an academic goal. Outline a goal setting conference with your students and determine how you will help them set and track SMART goals. Assessments can be personalized along the dimensions of time place, pace, and path in the same way that goals can be. During your 1-1 conference with students, you can determine how students want to show you that they have met their goal. This is written into the goal as something Specific, Measurable, Achievable, and Time-based. The decisions you and each student make for how to show mastery change each student’s learning path. Additionally, each student (with your guidance) may choose a different time, place, or pace to complete the assessment. What to Look For: Listen for reasons students like to choose their own assessment type and what kind of assessments they commonly choose or choose from. So how do you know what kind of assessment is best for each student? It all goes back to data. You can look at a student’s performance data to know whether they perform better on traditional quizzes and tests, or if they are better suited to creating something to show their understanding. Additionally, you can look at a student’s learner profile to determine how they like to learn and to demonstrate that learning. Maybe they prefer being alone in the hallway to read and take a test, or maybe they prefer watching a video with a group and doing a project. The learner profile helps us lead students to assessment decisions that promote their success. In a best-case scenario, you would look at both performance data and the student’s learner profile to help match them to the assessment that is best for them. In cases where students want to work in groups, you can use both sets of data to find group members that will either support or challenge each other based on students’ needs. This can mean matching a student who has mastered material with a student who is near mastery to challenge the first student and support the second, but it also can mean matching students based on interests and letting the students work together in supporting each other’s interests or challenging them to learn more about others by grouping students with different interests. You can also use these strategies for creating project-based or problem-based lessons for students (see section 4.1.3, Step #3). Competency: I can develop strategies for personalizing assessments (4.3). Create a list of assessment options for one of your units. Align a list of assessment options to various student interests or preferences. Create personalized assessment options for your students, complete with descriptions of how and for whom the assessments will work best. Learning playlists [https://edtechbooks.org/-oCS] and choice boards [https://edtechbooks.org/-Syr] are common ways that teachers allow students to choose their path through a group of learning activities related to a specific concept or skill. Both of these approaches provide students with a limited range of options focused on a specific learning outcome. Much like a music playlist, a learning playlist is a group of learning activities ordered in a linear sequence. A graphic organizer, typically in the form of a table or grid, with one activity in each cell. Students choose among the activities as they work towards learning a particular concept (sometimes called a menu board). Students complete all activities in the playlist in a specified order without a specified timeline (path is not personalized). Students complete select activities in a list based on pre-assessment performance data (path is differentiated but not personalized). Students complete all activities in the playlist but may choose the order of completion (path is personalized). Students complete required activities and have other activities that they can choose to do for additional review, practice, or enrichment (path is personalized). Students can choose the number and sequence of activities they complete until they reach mastery on the assessment (path is personalized). What to Look For: Look at how these teachers create, use, and support playlists in their classrooms. How could you use some of these ideas to implement personalized playlists in your class? Figure 4.4 Example of a high school playlist created in Canvas. Figure 4.5 Example of a playlist from Lindsay High School that displays the objectives and activities students need to master by the end of the year. Choice boards or menu boards share the purpose with playlists of providing learning path options to students. However, often choice boards are organized intentionally in rows and columns. For example, tasks in columns might be organized based on learning preferences while rows are organized by difficulty (see examples in Figure 4.6 and 4.7). 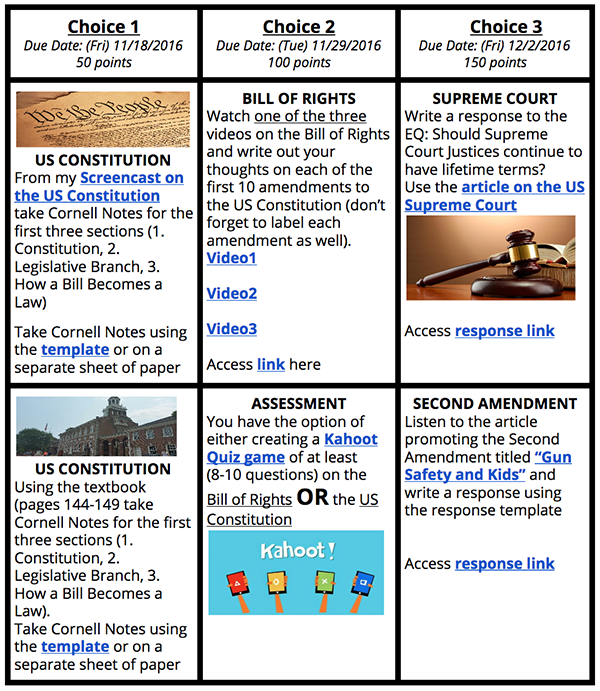 Figure 4.6 Examples of a high school history class choice board. Personalization can also happen with students using adaptive learning software. Most adaptive learning software determines the learning path for the students based on individual needs and performance. This is a kind of differentiation that would be very difficult and time consuming for a teacher to do for every student in the classroom. When students use the learning software, they are typically able to make other personalization choices about pace as well as time or place of learning. Adaptive Learning Software uses computer algorithms to deliver a customized path through learning activities for students based on their needs and past performance. The use of adaptive software in classrooms is becoming increasingly common. Adaptive software often provides data dashboards regarding student activity and performance to teachers so that they can provide additional support to students with 1-1 tutoring or small group instruction sessions. A few examples of K-12 adaptive learning platforms are listed in Table 4.4. Video 4.17 shows how an adaptive platform works. Table 4.4. Examples of adaptive learning platforms. ALEKS is a Web-based, artificially intelligent, educational software originally developed by a team of cognitive scientists and software engineers at the University of California, Irvine, with major funding from the National Science Foundation. ALEKS uses Knowledge Space Theory and adaptive questioning to teach mathematical concepts. Imagine Learning offers online lessons in Literacy, Spanish, and Mathematics. It offers thousands of learning activities that are standard-aligned, challenging, and engaging. The learning activities utilize a gamified system, allowing students to earn currency that can be used to customize their avatar and unlock in-game features. DreamBox is an elementary and middle school math software that uses standards-aligned activities and actionable data to adapt to individual students. Its integrated assessments and instruction routinely measure students’ understandings in order to guide them through a personalized learning program. What to Look For: Observe how the software customizes the learning path for students and how students can use the software at their own pace, time, or place. When envisioning what personalization looks like, it is easy to only think of students working independently with technology. It is important to remember that personalized learning is not the same as independent learning. In fact, determining ways to help students work together and support each other can be motivating for them, as well as helping them to develop other important 21st century skills such as the 4 Cs (Critical Thinking, Creativity, Collaboration, and Communication). Part of personalizing around place is allowing students some choice over where and with whom they will learn. As a teacher you can make these decisions (differentiation) and/or you can teach students how to make these decisions and give them opportunities to make some of the decisions (personalization). Even if you make the grouping decisions for your students when working on projects, you can still give them opportunities to choose their roles within the group. What to Look For: This video shows how teachers counseled with students about their choice of who to work with. 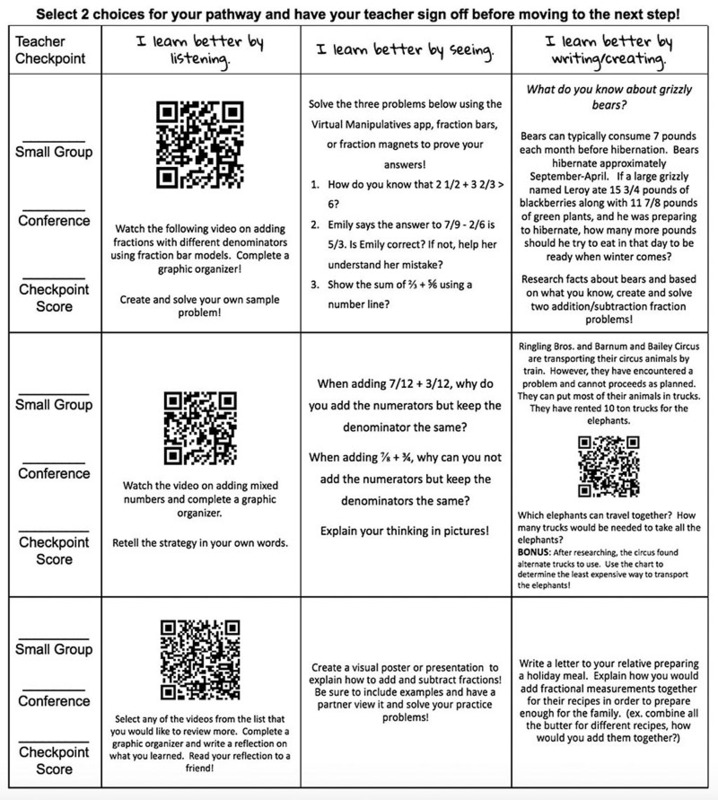 Table 4.5 contains some common strategies that might be used to help with choices around student grouping. Ultimately using a variety of grouping strategies rather than always using one strategy will likely yield the best outcomes. Competency: I can develop strategies for personalizing learning activities (4.4). Plan and create activities to use in a playlist that students can follow or choose from to personalize pace, time, place, and/or path.